1860 At least one person on the Rock other than Diego José (3.7), must have been feeling pleased with himself. The first prize of the Spanish National lottery was won by someone in Gibraltar. It was brought from Madrid in cash, by donkey, presumably under heavily armed guard. That year El Calpense, a daily newspaper in Spanish, began its life. Its politics were predictably right-wing and on the side of 'respectability'. There was also another Spanish language paper called El Anunciador. 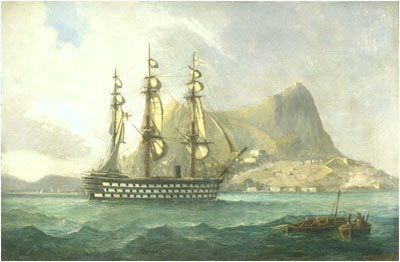 HMS Malborough near Gibraltar. A frequent visitor to the Rock, she was the flagship pf the Mediterranean Fleet at the time. 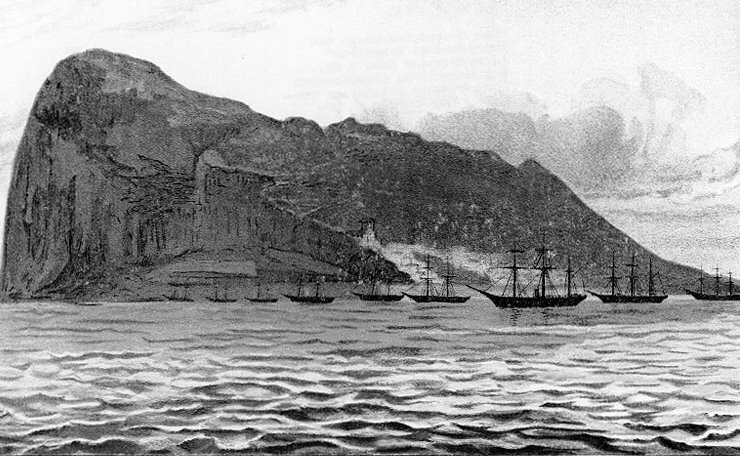 The American Civil War comes to Gibraltar. This picture shows the US warships Tuscarora and Kearsarge keeping watch on the Confederate cruiser Sumter. But which ones are which? My great grandfather, Diego Gomez (3.7) must have had a very good view of the proceedings from his newly purchased house at 42 Crutchett’s Ramp. 1865 The recently imposed duty on imports of wines and spirits was to be used to defray the costs of a Sanitary Commission instructed to provide the town with water that was safe to drink. Despite the more or less gloomy outlook, yet another one of my great grandfathers, the young Joseph Chipolina (3.1), then 21 years old, decided it was time to get married. 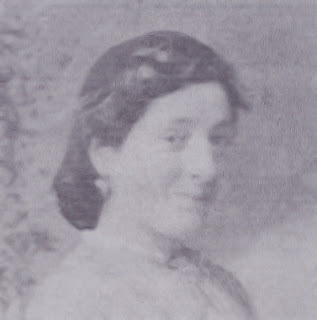 On the 27th of May, Josefa Morello (3.2) became his wife. She was one year older than him. Joseph's personal history is reasonably well documented since he eventually became the top official in the Gibraltar Post Office. At the time of his marriage, however, he was probably still only a postman. It seems that at that time the GPO had a postmistress by the name of Margaret Creswell, who lived in Campamento. She seems to have taken a fancy to the young Joseph (3.1) and was instrumental in getting him his various promotions. The juicier details of his career are unfortunately not available. The Town of Gibraltar. This photograph was taken at the turn of the century. The GPO Postmistress, Mrs Margaret Creswell lived just across the bay in a suburb of La Linea called Campamento. On the photo it lies more or less where the trees end and the beach begins. In the middle distance is the church of the Sacred Heart. 256 Main Street. This is the house I was born in. It had originally belonged to my great, great, great grandfather. 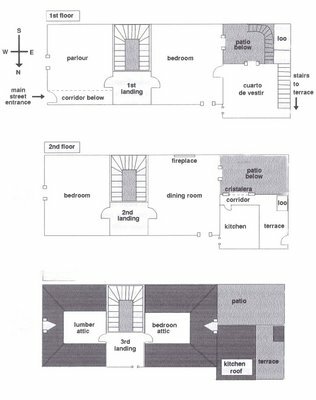 Although the property was eventually sold off, its long unbroken association with the family would make people assume it belonged to us. 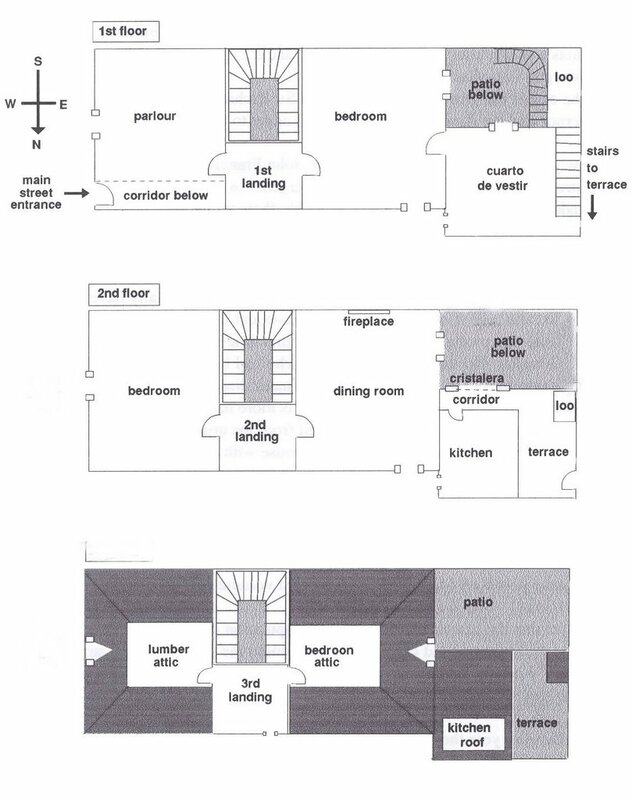 During the Second World War it was damaged by a bomb and was subsequently demolished. In July there had been yet another outbreak of cholera. It was a signal for the Ladies' Needlework Guild to get to work. They raised 14 000 Spanish dollars to set up soup kitchens. The epidemic ended in October. 420 civilians died. Perhaps as a consequence of this epidemic the Sanitary Commission, made up of local worthies, was finally set up and its members were charged with keeping the place clean and safe from any further outbreaks of plague and pestilence. 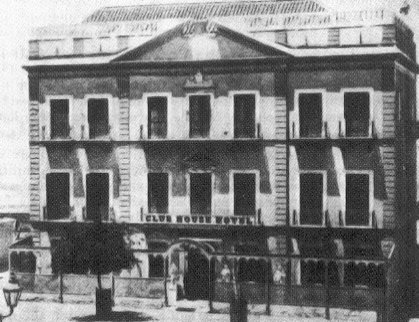 Although the rich traders of Gibraltar kept up a long rearguard action against it, the first public waterworks was finally inaugurated that year. 1866 This was roughly the time when another set of my great grandparents, got married. They were Thomas Letts (3.5) and Rosa Bottaro (3.6). 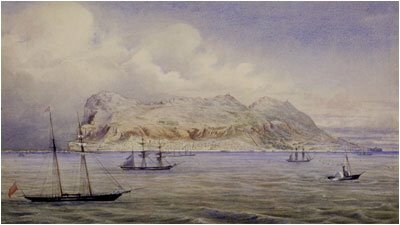 Thomas (3.5) was a soldier in the British Army, and it is possible that they met during a posting to Gibraltar. 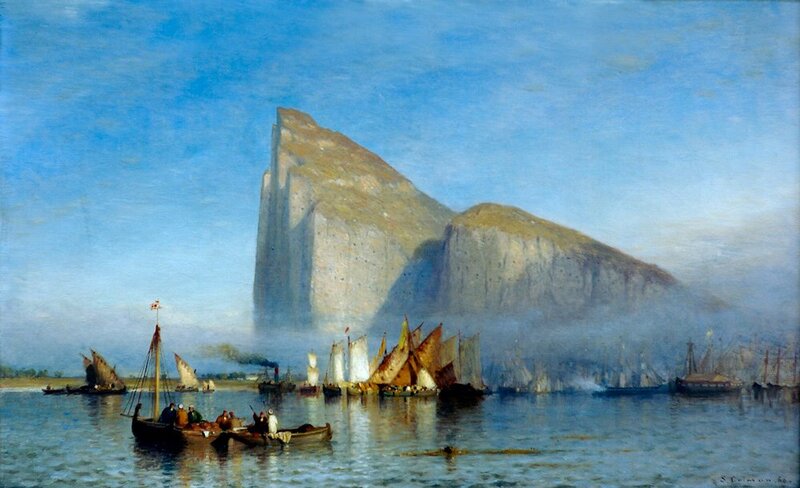 This attractive contemporary portrait of the Rock shows any number of felucca and other craft including a steam ship, in and around the port. The north face of the Rock is pockmarked with holes suggesting a huge number of defensive gun emplacements. 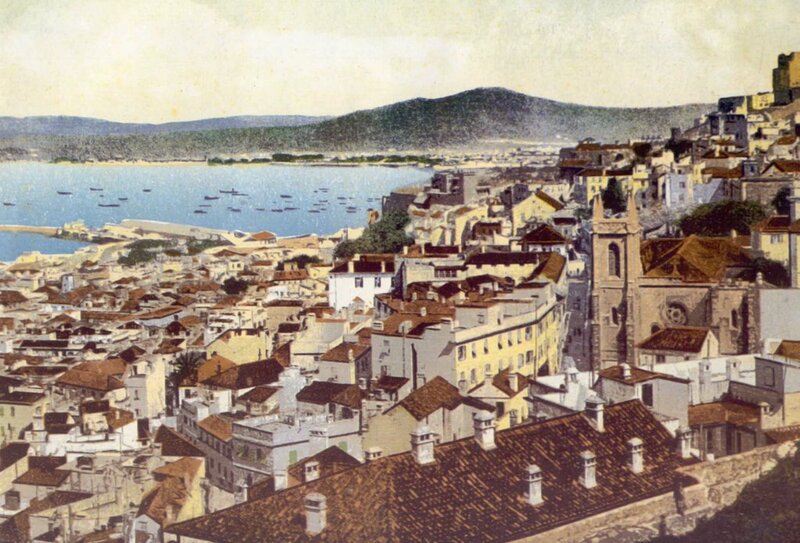 This was the Gibraltar where my great grandfather, Thomas Letts (3.5) met his future wife Rosa Bottaro (3.6) and in which my grandfather, Angel Chipulina (2.1) was born. 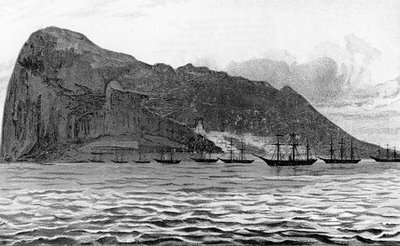 By the end of the year the American Civil War had come to an end and Lieutenant-General Sir Richard Airey had become Governor of Gibraltar. General Sir Richard Airey. 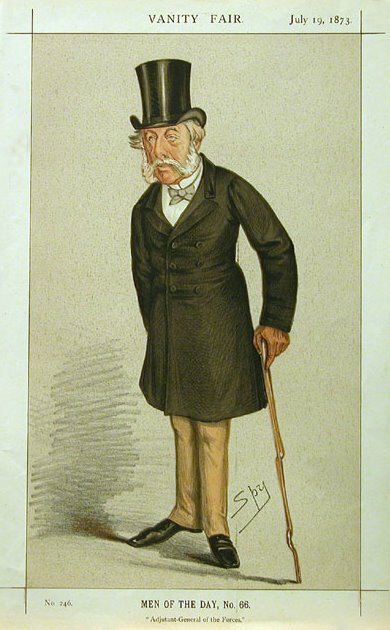 This caricature was drawn in 1873 several years after his stint as Governor. 1867 A few years later, on the 9th of February my grandfather, John Francis George Letts (2.3), was born in Montreal. 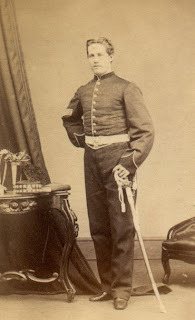 His father Thomas (3.5) was now a sergeant in the 4th battalion of the Rifle Brigade serving in Canada and was probably there while the Civil War still raged across the border. The new baby was to be known to family and friends as George (2.3). 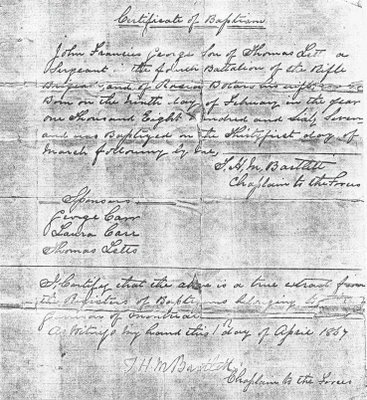 His certificate of Baptism still exists in the form of a crumpled piece of blue note paper signed by the 'Chaplin to the Forces' of the Garrison of Montreal. The family was relatively large. George (2.3) had, or would eventually have, a brother called Joe and four sisters, Midge, Sarah, Rose and Isabel. Top: My great grandfather Thomas Letts (3.5) Below: His wife and my great grandmother Rosa Bottaro (3.6)In the original photograph they are both posing with their son George (2.3). It was taken in 1867 and is the oldest extant family photograph. It is a curiosity in the sense that the basis for present day photography was only developed by Richard Maddox in 1871. Unfortunately I have no idea which of the various older processes available at the time was used to produce this photograph. Mary Relle was probably also born around this time although almost certainly not in Gibraltar. She was the mother of the man who married my mother's cousin and very good friend, Mercedes Letts. Mary's father - Mortitz Relle - was German and according to family legend had once been the director of the Kaiser's personal band. Several people have investigated this claim and found it wanting. The photo shows a sergeant in the uniform of the 1st Battalion taken in Montreal around 1867. Moritz is also supposed to have composed music in Germany, England and Canada. 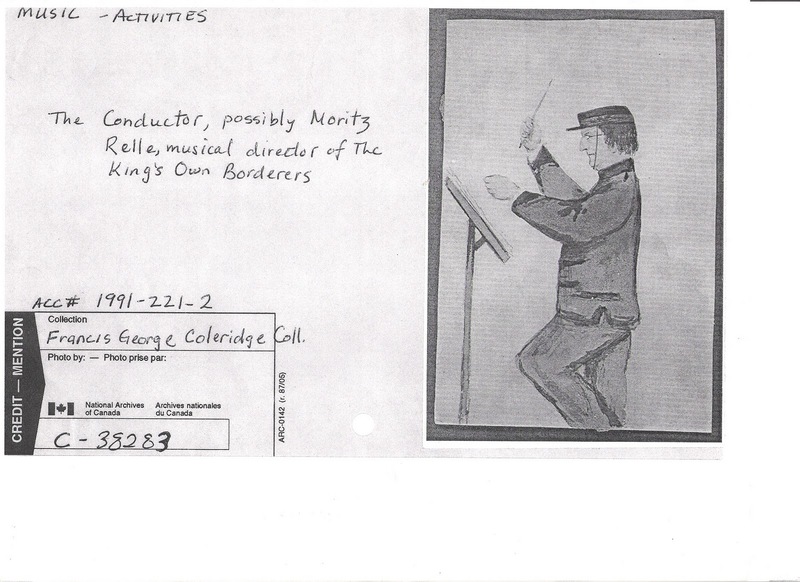 At least three pieces of his military band music are still available. 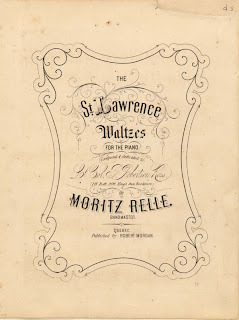 For example, he composed The St Laurence Waltzes for Piano which he dedicated to Lt Col. P Robertson Ross – 1st Battalion of the King’s Own Borderers. 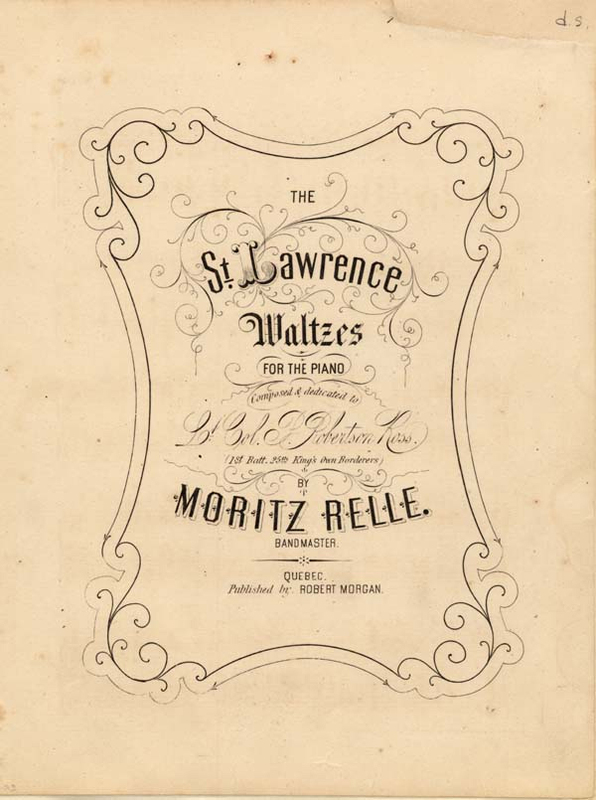 It was first published in Quebec. An ordinance map survey of the Moidart district in Scotland shows a certain Lt. Col. Patrick Robertson Ross as owning large bits of the area. It seems possible that this is the fellow he dedicated the waltzes to. What is less clear is whether Ross was a friend or wheher Moritz was just sucking up to his boss? Another bit of music was The Valentine Gallop for Piano – Published in Montreal. 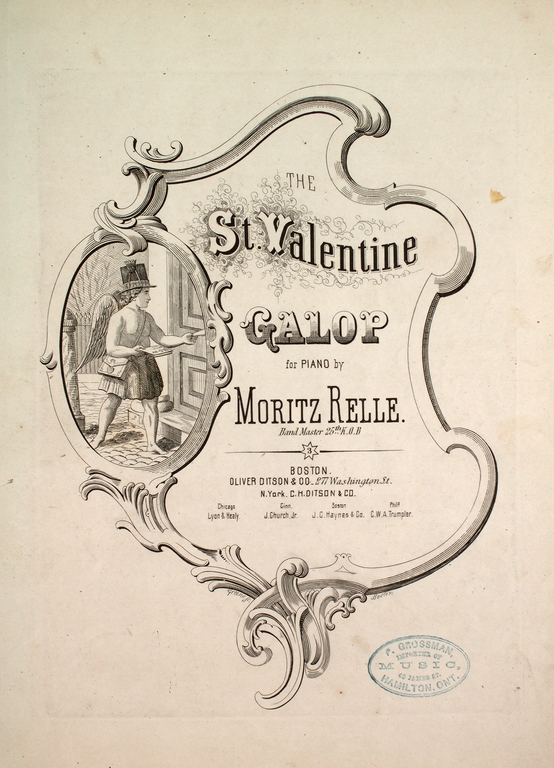 The sheet music can be downloaded from the net. The Crystal Palace incidentally was an exhibition hall built for the Montreal Industrial Exhibition of 1860. It was an important and imposing structure. The Exhibition displayed agricultural and industrial products from British North America and The Prince of Wales officially opened the exhibition. To have been involved in this project in any way suggests that our Moritz was quite an important man – at least musically speaking. 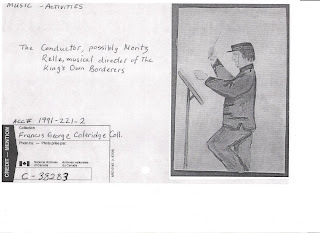 This sketch is from the Canadian Archives and Library. In 1866, Moritz came to Gibraltar as a relatively young man of thirty two. Here he promptly met and married Emily Wood. He married in 1866 and then seems to have lost no time in producing six children – Moritz, Emily, John, Mary, Herman and Luisa. The children’s birthdays show that they were born at what appear to be carefully calculated two year intervals. Mary is of course the Mary Mercedes Letts. John and Herman apparently worked for the Eastern Telegraph Co.
grief it will be to his family and friends the death of Mr Relle will be the cause of a serious public loss for it will be impossible to find in Gibraltar anyone gifted with the knowledge and love of music which he possessed. 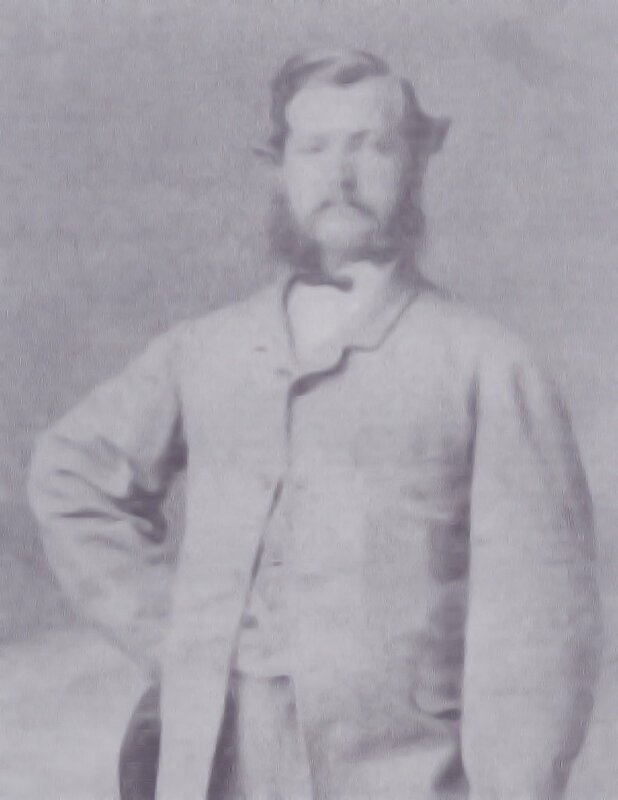 Mr Relle leaves a widow (the daughter of Mr Woods of the Port Office) and his children to mourn the loss of a loved husband and affectionate father." 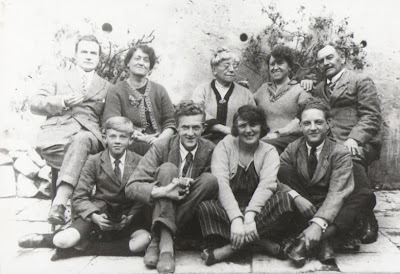 This photograph was taken in the 1920s in Schonberg House. Left to right back are:Dudley Wills, Mary Relle Wills, Emily Relle - Moritz’s wife - Emily Rugierri, and her husband. In the front row are: Edwin Wills, Maurice Wills, Muriel and Hector Ruggieri. On the 23rd of October Josefa (3.2) gave Joseph Chipolina (3.1) his first son. 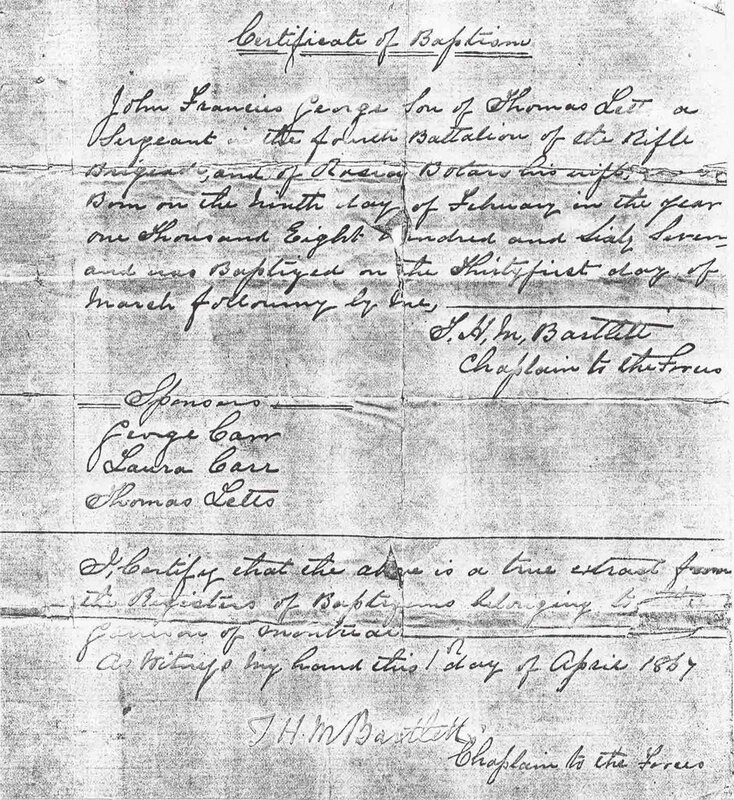 The church records show that he was registered as Angel Chipulina (2.1) which confirms that Joseph (3.1) was the person responsible for the change in spelling of the family name. In fact his own name appears in the Gibraltar Directory with the surname spelt 'Chipulina'. That same year Karl Marx published the first volume of Das Capital. 1868 In November the census shows a civilian population of 15 782. Despite the epidemic and chronic unemployment the figures show a small increase. Work on the new drainage system and water supply was begun by the Sanitary Commissioners. The opening of the Suez Canal at Port Said. It was also around this period that a local man called Aaron Cardozo died. 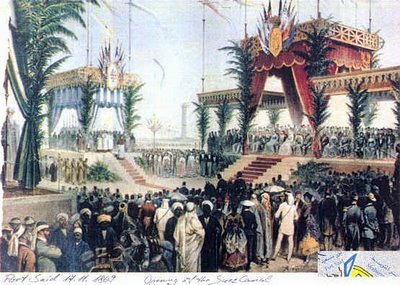 He had made his money prior to the opening of Suez and had ended up a very wealthy man. With some of the proceeds he built himself what was arguably one of the most imposing houses in Gibraltar at the time. His heirs, however, didn’t seem to fancy living there and rented out to the Club House Hotel. The Club House Hotel in Commercial Square: a contemporary photograph. It may have been a question of the grass being greener on the other side. Nevertheless his remarks, including his opening criticism, continued to be a valid commentary on life in Gibraltar for at least another hundred years.